Shiner minnows can be fished anytime of year, in any water condition, low or high. Yet they really "shine" in winter high waters. 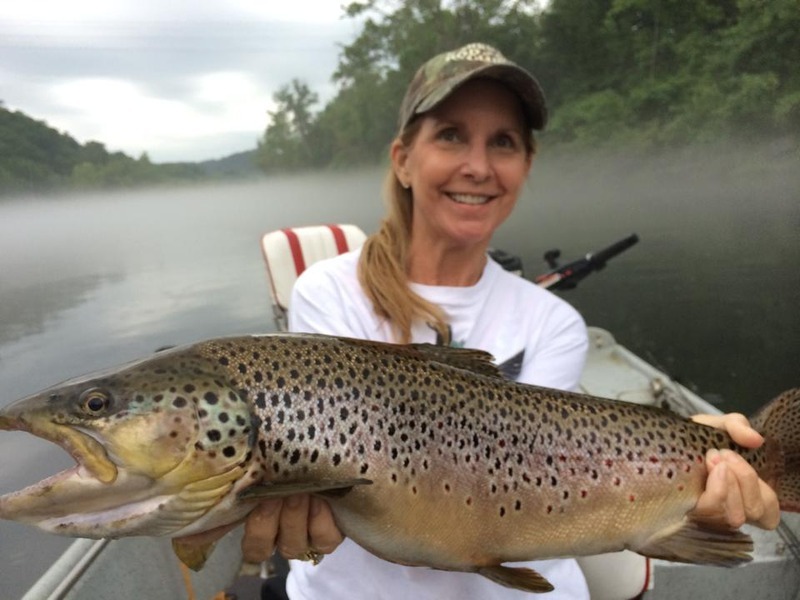 When weather turns cold what big trout like to eat gets scarce. Worms, crayfish, and insects become dormant. Shiner minnows, about 3 inches long, become a favorite meal because unlike most natural baits, they don't go dormant. And for a larger trout, it's easy to run down and snap up shiner minnows. Another advantage is that minnows are a tough bait that stay hooked even when bounced around on rocky bottoms in strong currents. 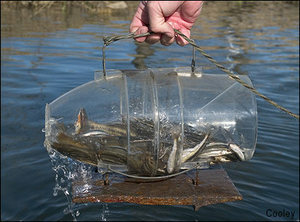 Minnows are most effective when fished from December through mid April. Hungry from not eating much for a month or so while protecting spawning nests, male browns are ready to start making up for lost meals in December. Rainbow, which normally feed on other natural foods, also take minnows in these months. Come spring when more natural baits float the current, rainbows won't take the minnows as frequently. Minnows are very effective in high water. During high water browns are going to eat sometime during the day. Strong currents kick up more food, including minnows. If you can catch a water rise and fish it down the river with the minnows, your luck will be good. One advantage to fishing minnows over waiting for a winter shad kill is that you can get the minnows anytime. February is a great month for fishing minnows as other natural baits like crayfish, worms, and insects are dormant. I learned to catch shiners at a very young age from my father. I grew up on the banks of the White river in Cotter Arkansas. Cotter has several springs running into the river that warm the water just a little. That warmer water is where the shiners like to hang out. My dad would trap the shiners to bass fish with on Crooked Creek, and it was for Dad's bass fishing trips that I first picked up on minnow trapping. 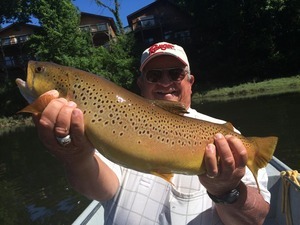 After I started guiding in 1982 when I was 15 years old, I decided to give the shiners a try on the White River. It worked well enough that I continued to use them today in all water conditions. Over the years I have experimented extensively with minnow fishing. Slow water, fast water, high and low water, different hooking methods, and learning to drift the minnow at the same speed as the currents took some practice. The right drift speed is more critical than the bait itself. Use too little weight so that the minnow drifts too fast, and the smarter (read bigger) trout will let it pass. Same thing happens if you use too much weight and the minnow drifts too slow. Shiner minnows are easy to catch if you know where to find them. In the White River they are most abundant around the Cotter area. The springs there flow into the White warming it up a bit, which the shiner minnows prefer. Some can be found upstream from Cotter, but not many. Upstream from Cotter you'll find a few at the mouths of creeks and in slow eddy borders. Downsteam from Cotter you'll find them in gravel bar shallows, at creek mouths, and in slow eddies. Using a clear plastic minnow trap baited with saltine crackers makes catching the shiners easy. Use an entire square tube of saltines. Before you open the tube crush the crackers. Open the tube and pour the crushed crackers into the trap. Place the trap in the water with the funnel end facing downstream. The crackers will drift out a little, which is good. The shiners will feed moving upstream following the cracker crumb trail into the trap. Leave the trap in the water about 30 minutes and you'll have all the minnows you need for the day. When you pull the trap up, cull out and sort the minnows so that you end up with mostly 3-inch long fish. The shiner minnows are easy to spot. They have a silver side and belly with a large black stripe over the silver side that continues into their eyes. Their backs are deep green. Keep the minnows in either a minnow bucket or in your live well. Make sure they get fresh water about every half hour. Trailing the minnow bucket in the water solves this problem. You can buy the clear minnow traps at Harp's in Mountain Home, at Big Red's Bait and Tackle in Lakeview, or at almost any store offering a complete line of bait and spin fishing tackle. You'll need to attach a chunk of heavy steel to the bottom. Otherwise the trap tends to drift about. Tie one end of a length of rope to the handle of the trap. At the other end attach some type of float so you can pull the trap back up later. Use a #6 Eagle Claw Kahle hook. Hook the minnow through the lower and upper lips. Use a 1/8 ounce bell sinker in water up to 3 generators, a 3/16 ounce sinker in 3 to 6 generators, and a 1/4 ounce sinker in 7 to 8 generators. Sinker weight may vary slightly depending on the size of the minnow and line size. The idea is to get the minnow to the bottom without dragging a ditch in the bottom. If you are hitting the bottom but not dragging on the bottom, it is perfect. To fish the minnows look for anything which obstructs the water flow so that a little calm area forms downstream right behind the obstruction. Logs, rocks, boulders, etc. will all have these little calm spots behind them on their downstream end. Also look for islands where the current flows around both sides. At the downstream end of the island the two currents will come together forming an eddy that turns into a backwater. In these spots the current will flow backwards slowly. 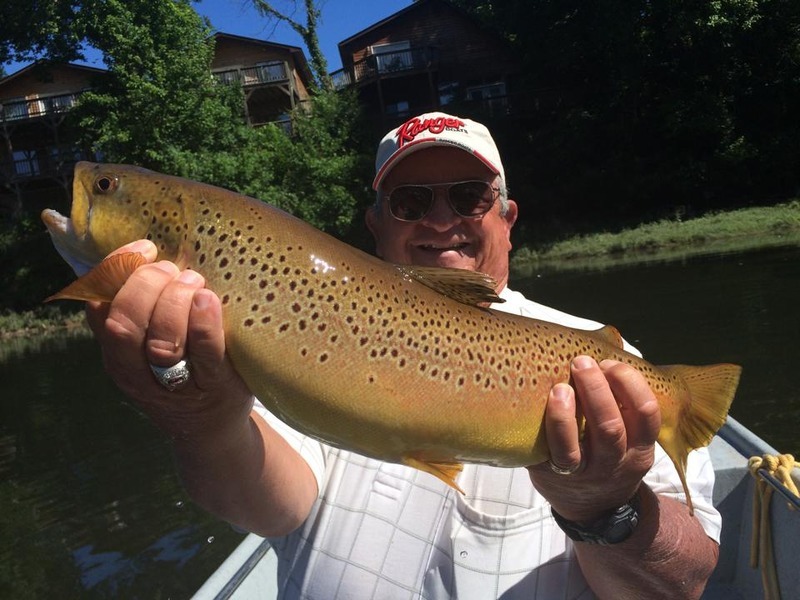 Trout lay in these slow waters right on the edge of the fast currents. They lay in wait for food to flow past. Look for drop-offs in the current. For example, if the water is about 6 feet deep, then suddenly drops to 10 feet deep due to bottom structure, this too is a place to fish your minnow. Trout will lay in under that 6 foot level and the main current flows over the top of them. Again, they lay in wait for food to flow past in the main current where they can hold without having to fight the current. Cast upstream of your target and let the bait drift into the hole along the edge of the current. Be patient and let the minnow drift around and slow down. If the current pulls your line tight the minnow is no longer drifting. Retrieve and cast again. If the minnow drifts into a slow eddy let it swing with the current for about three minutes. If you get no action, retrieve and cast again. Make haste slowly by covering a lot of water where trout like to lay up. They won't move very far to chase your minnow, so you need to keep the bait moving into new spots. On an sharp bend in the river there will be a slow spot in the current on the inside area of the bend. Gravel bars form in these slow spots. This is another spot where trout will lay in wait for the faster current to push food to them. Browns like to move into these slower water gravel bars to feed.